The 2018 quarterly results from the holding company combine total results of the two branches, but the results for the second quarter of 2017 are for Knight Transportation only and do not include Swift’s results. Knight-Swift said it generated second-quarter net income of $91.3 million, or 51 cents per share, compared with $17.9 million, or 22 cents per share, in the same period a year ago. Total revenue in the second quarter in 2018 was $1.3 billion, up from $273 million a year ago. The Knight Transportation side releases results for its two major divisions — Knight Trucks and Knight Logistics. Knight Trucks reported operating income of $56.6 million, a rise of more than 119% from $25.7 million a year ago. The results include the numbers from Abilene Motor Express, the Richmond, Va.-based carrier that Knight-Swift purchased in March. Abilene had annual revenue of about $100 million prior to the acquisition. The division saw a strong freight market and tight capacity generating a 24% rise in revenue per tractor to $52,353 as a result of a 21% increase in revenue per loaded mile. The average length of haul was 498 miles, and the division had an average of 4,875 tractors during the quarter. Knight Logistics reported operating income of $4.1 million, a 55% increase from $2.6 million, on revenue of $76.6 million, up nearly 45% from $52.9 million. Revenue per load rose nearly 27%, and load volumes rose by 15%. A rise in purchased transportation costs led to a 60-basis-point decline in the brokerage gross margin percentage. 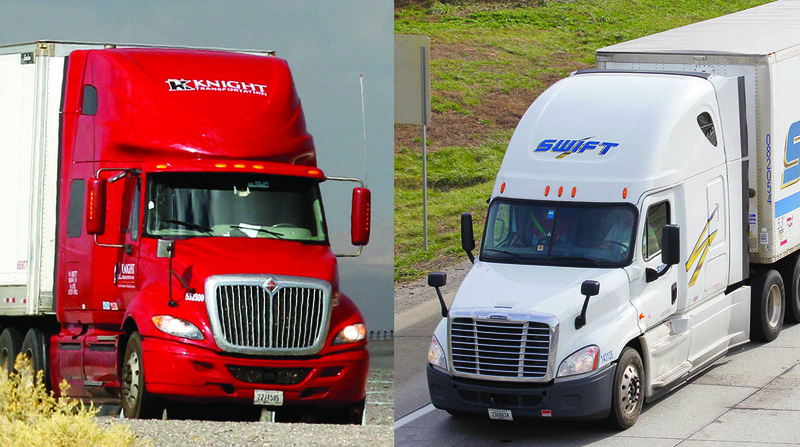 The Swift Transportation side breaks down its results into four major segments — truckload, dedicated, refrigerated and intermodal. Divisionwide, Swift saw its average tractor count fall by 658 units due to the driver shortage and the decision to exit underperforming refrigerated and dedicated accounts. The fleet totaled about 14,770 tractors at the end of the quarter. The truckload unit reported revenue of $363 million and operating income of $45.8 million. Its adjusted operating ratio was 87.4%. Average revenue per tractor rose 8.8% to $48,584 from $44,674. The firm in recent quarters has focused on improving revenue per tractor, leading to a change in freight mix, a shorter length of haul and fewer miles per tractor. The dedicated unit reported revenue of $141.9 million and operating income of $20.7 million. Its operating ratio was 85.4%. The unit saw average revenue per tractor rise 3.5% to $47,729, primarily due to increases in contract rates. Swift Refrigerated reported revenue of $180.8 million and operating income of $3.6 million. The adjusted operating ratio was 98%. The average revenue per tractor fell nearly 7% to $46,061 as miles per tractor declined by almost 11%. The intermodal unit had revenue of $94.7 million and an operating income of $4.2 million. Its adjusted operating ratio was 95.6%. The division saw improvements in container turns and a 16.6% rise in revenue per container. Average revenue per load rose 4.3%. Knight-Swift Transportation Holdings ranks No. 5 on the Transport Topics Top 100 list of the largest North American for-hire carriers. It reported 18,381 company owned tractors and 4,688 owner operator tractors.